Located on St. James' Way, La Ferme Ostalapia features a terrace in the garden with panoramic views of the Pyrenees Mountains. Free Wi-Fi and a TV are provided in the guest rooms. The decoration in the rooms includes stone walls and exposed beams. Each room has a minibar and the en suite bathrooms are fitted with a bathtub. Traditional specialities made using regional produce are served in the restaurant, which features a rustic décor. A continental breakfast is prepared every morning and you can enjoy a drink from the bar. The beaches in Guéthary are 4 km away and Saint-Jean-de-Luz is a 10-minute drive from this hotel. Private parking is free on site. If you wish to dine in the restaurant, please call in advance. Please note that the restaurant is closed on Wednesdays. The reception is closed from 17:30. Offering a forest view, this room includes a minibar, sloped ceilings and free Wi-Fi. 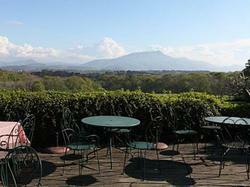 Offering views of the mountain and the vineyards, this room includes a minibar and free Wi-Fi. Offering a balcony with a mountain view, this room includes a minibar and free Wi-Fi. Offering a terrace with views of the mountains and the vineyards, this room includes a minibar and free Wi-Fi.